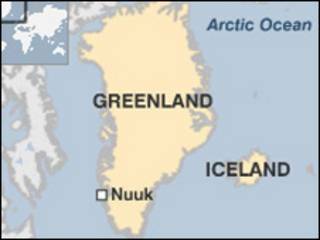 Greenland has been marking a step towards independence from Denmark, its ruler for 300 years. Ceremonies recently took place to mark the start of self-rule, approved by voters in a referendum last year. Queen Margarethe of Denmark and the prime minister made the long trip from Copenhagen to attend the ceremonies in the capital, Nuuk. Canons were fired out to sea after the raising of Greenland's simple red and white national flag. Self-rule will mean Greenlanders earn more from the riches lying under their melting ice fields and surrounding ocean, including oil, gas, minerals and precious stones, but the large subsidies provided by Denmark are expected to be reduced. The newly elected Prime Minister, Jakob Kuupik Kleist, said self-rule was an important achievement for a small community. Greenland, he said, was now accepted as a nation alongside others. The local government will take on responsibility for policing and justice and the Inuit Greenlandic becomes the official language, but Denmark keeps control over defence, foreign and monetary policy.